Chain conveyors present a space-saving and diverse alternative to roller conveyors. In contrast to roller conveyors, chain conveyors do not have any bearing rollers and are therefore more cost-effective. It serves for transverse or longitudinal conveyance where the conveyed material has a stable running surfaces. Due to the robust construction, its use in critical surrounding conditions is safe. Modern techniques and materials also guarantee a long service life with long maintenance intervals. 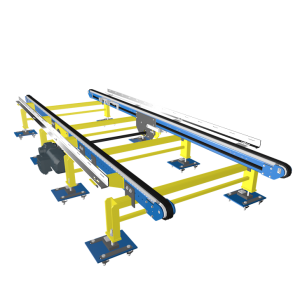 The chain conveyor is used mainly to transport pallets and lattice boxes.